And while a good number of the tributes that have come pouring in over the last 24 hours have paid tribute and homage to a man that film owes a great deal (and all of them, you could argue, still don’t do his work justice) you only need to look at the names of the people who cite him as an influence to see the legacy he leaves behind. Yes there’s Tim Burton, James Cameron, Steven Spielberg and Guillermo del Toro, but there’s thousands more whose names you don’t know. Just look at the long roll of credits of any of the big movies that come out this summer. You’ll find a ton more people who have no doubt worshiped at the altar of Harryhausen. You only need to look at his work to realize his greatness. The 7th Voyage of Sinbad. Jason and the Argonauts, Clash of the Titans. 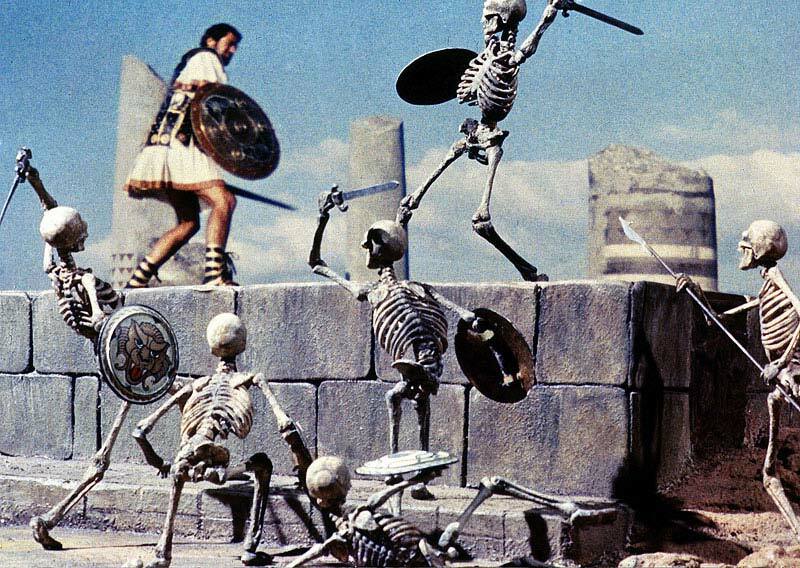 While every movie now trumpets their computer generated special effects, Harryhausen got his hands dirty. Literally. And the progress forward in special effects only makes you appreciate his work that much more. An army of thousands racing across the battlefield only means something to you if you care. If any action movie this year leaves you feeling kinda lackluster, it’s because the filmmakers forgot this mantra. The reason people remember his work so fondly is because he made sure you cared about his characters. I remember the hushed tones in the schoolyard when Clash of the Titans made its cable debut. And I remember seeing it long after everyone else and, yeah, they were right, Medusa scared the living hell out of me. The reason that people still watch King Kong is because of the emotion that was evoked from the titular character. That’s something Harryhausen believed deeply and tried to pass along. I know it’s resonated with me. Hopefully it will resonate with future generations, so that, while the approach to effects will change, the thought that goes into them does not. Let that be the lasting tribute to Ray Harryhausen and his work.